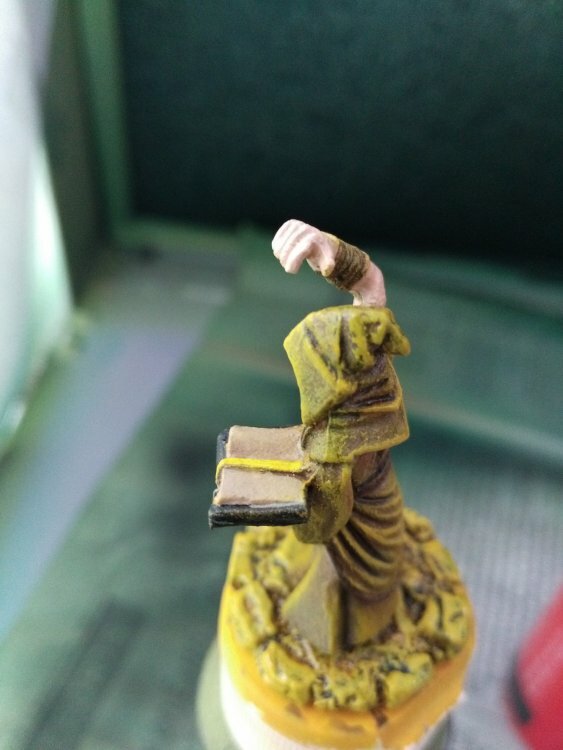 Started Cthulhu Wars for a friend today and I think I need some help with the Yellow Sign cultists. 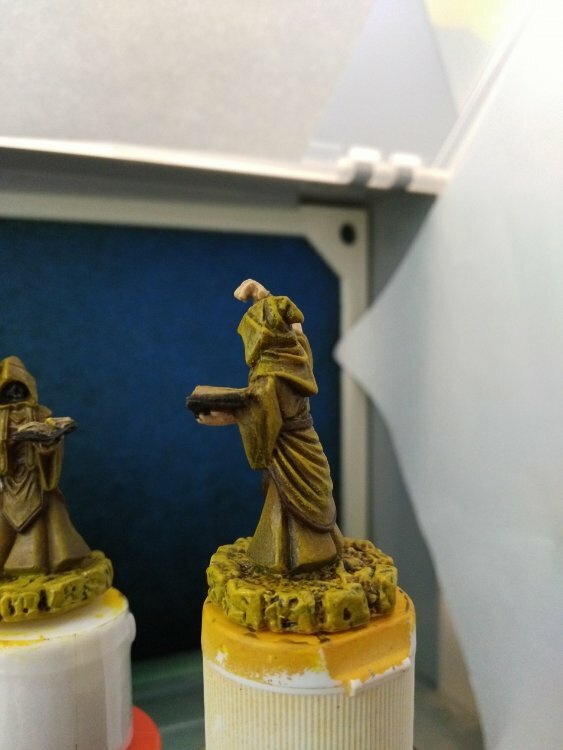 I'm starting with the robes and I feel like something went wrong somewhere along the line, not sure exactly how to fix it. 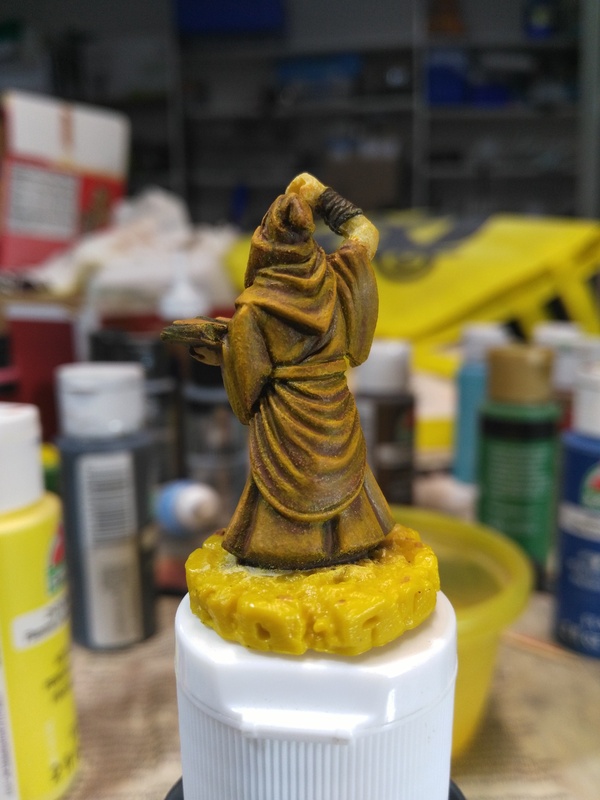 Base coated black, then drybrushed ochre through yellow, then went back through glazing ochre through yellow. Maybe a dark brown wash will help. Could use some help. Is your problem that the robes have green shadows? If yes, that is caused by the mixing of the pigments in black and yellow (most black has a slight blue bias, so when mixed with yellows they create dark green). I am not a professional and have only middle-highschool level art education, so I don't feel confident to go into the colour teory behind it. I use artist paints, so some of the result I can get may not be replicable with the available hobby paints (phtalo green + quinacridone magenta = purple [I must thank Pingo for that knowledge]). 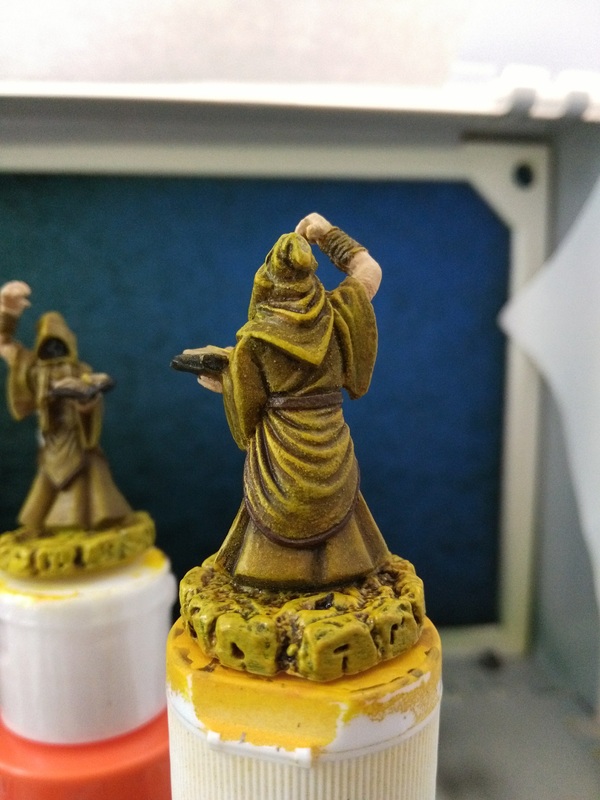 A wash should be able to cover some of the green, thought it depends on what effect you want to have. 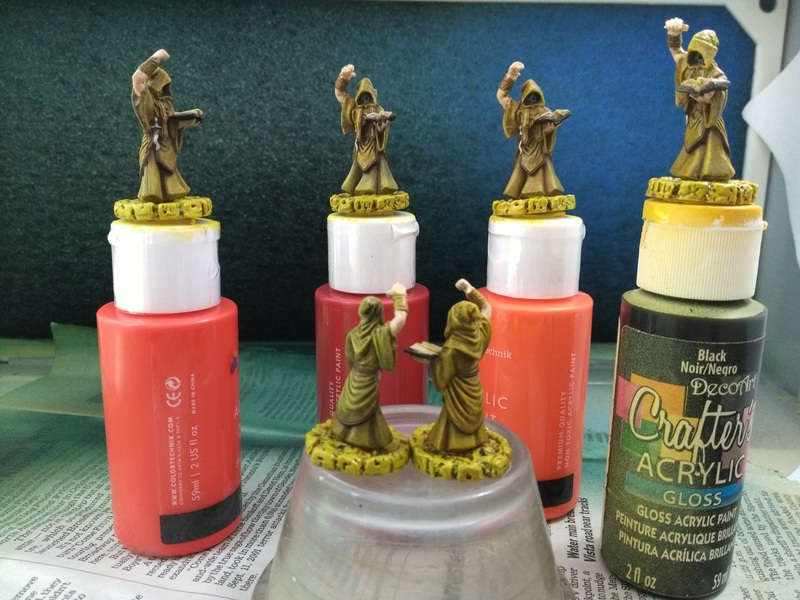 You could also paint in the shadows with a brown, or just strip and repaint the figure. Wow thanks dragon, I honestly couldn't even put my finger on what was wrong but that is definitely it. I wouldn't have thought you'd get mixing of pigments just layering over dry black, but that looks like the problem. 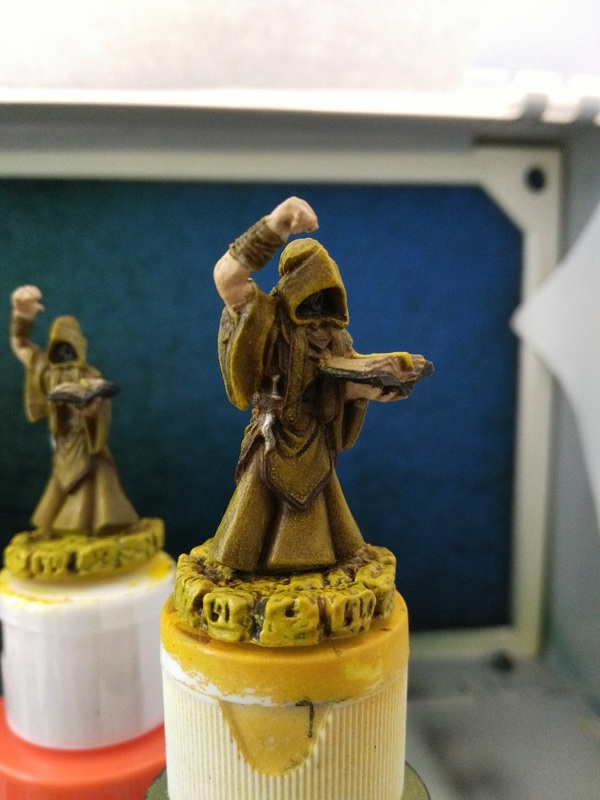 Will remember to base coat in brown for yellow shades in future. 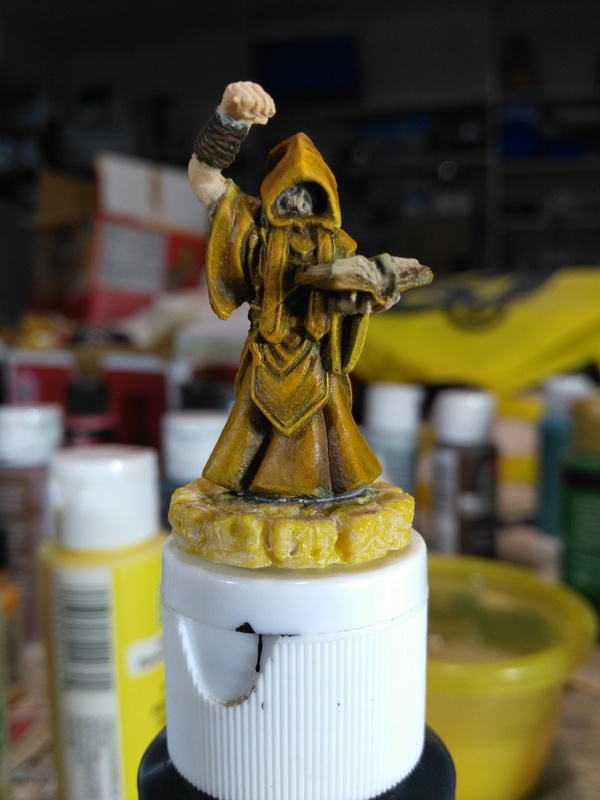 I went over the model with a thin brown glaze/almost wash, and then went over the greenest bits with more. Will have to bring the highlights back out again, but it's looking a lot better. Second time you've rescued me! Back on track thanks to dragon. Oh no, competition! Now I need to spend more time painting! Nice start! My plan for Yellow Sign is to shade with Brown Liner and work up through a brown into yellows. Ha, competition I think not, I've seen your work. I don't know how you get such amazing shading on drybrushing. When I try it just seems to completely cover the earlier coats. Anyway this guy has decided to go green on me again >:( I think it might be the gloss medium I'm using for glazing. 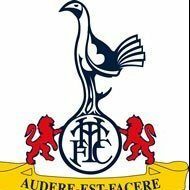 Orrr, maybe not? Am I just a green hypochondriac now? I swear there's more green than in the previous pics. Looks about the same amount of green as the previous picture. Allright "finished" with these guys. When I say "finished" I mean I'm overcoming my perfectionism to move on to something else because they're serviceable. Tried to use some speed painting techniques, but still took way too long, need to work on that. If anyone's got any tips on how I could have made them better without, layering/glazing/something else that takes forever, they would be much appreciated! They look a good cult of dark devotees ! Cthulhu Wars: Onslaught Three, featuring a faction called "The Ancients" has just been announced by Petersen Games, set to launch July 17th. EDIT: starts at 8 AM CST Monday July 17th. I plan on posting something a little more friendly looking very shortly. coughwyrmgeardragoncough but in the mean time I painted this for fun and practice! Also would take some advice on dealing with small details like a face. On this miniature it was nearly impossible to just paint specific details of the face without smooshing the entire face with paint. I'd wanted to give the figure blood red eyes. That didn't work out and I ended up painting over the face in white to start over again. 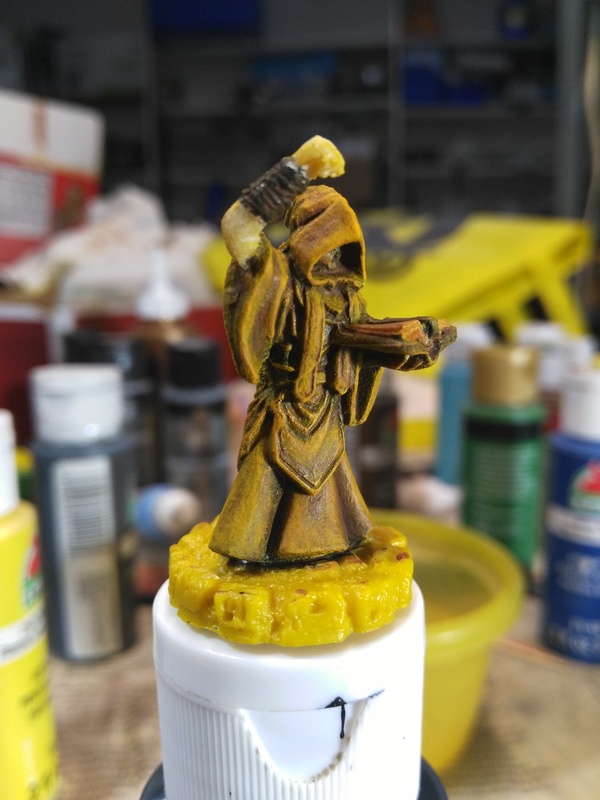 I do overall like how this miniature turned out. The bones aren't crispy perfect white, the clothes look like a creature that's been walking through mud and dirt for a long time. 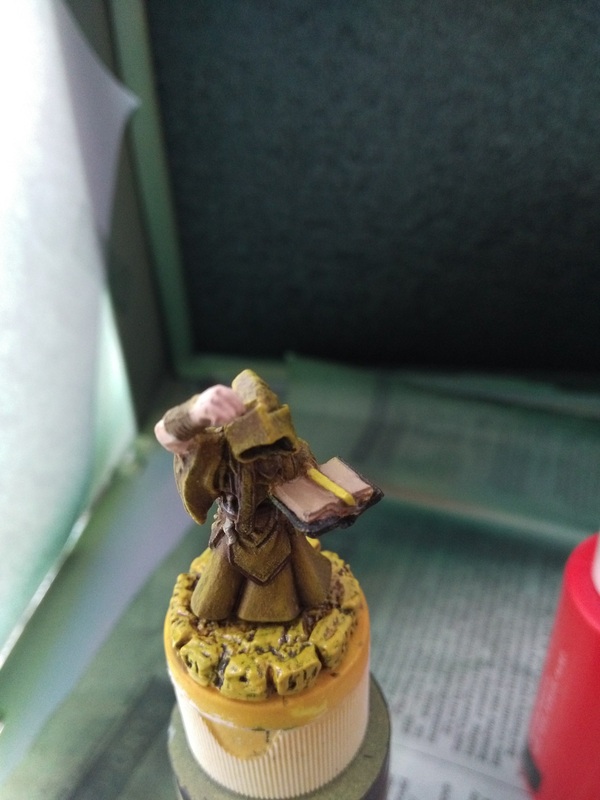 Didn't know how to paint the base so I went with some of my extra black wash which worked out as it sort of made it look like it was standing on bone. Tried a new technique on the scythe. I did the base coat as filigree silver, then I did a paint of dragons blood red, then when that dried i went over it again with the black wash to give it this dried blood effect. A technique that is probably standard but one I personally just learned by experimenting! I took photos from start to finish on this project. The horror theme wasn't originally intended but sort of came to be when I noticed the dragons blood red! Come closer... I might be able to cut you a deal! Hello there! 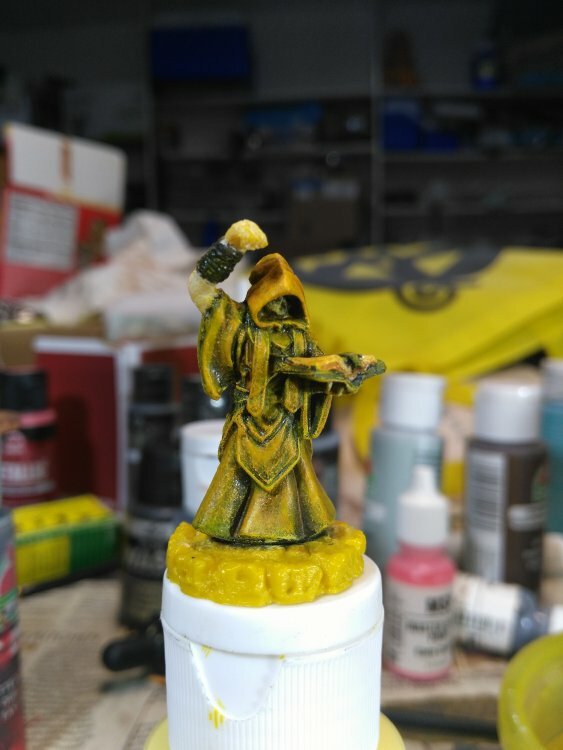 I'm new to the world of Reaper Bones. I don't usually buy unpainted mini, let alone unpainted minis which require assembly but the Khanjira The World Breaker and the C'thulhu minis were something I couldn't walk away from. I'm a Call of Cthulhu fanboy, I have always wanted to use him in an D&D campaign and never thought my Horrorclix Mighty Cthulhu fit the bill, especially with the stagnant form of him rising up out of the ocean. I also plan on using Khanjira The World Breaker as the Tarrasque. The Tarrasque is a gargantuan creature. What size round base would I use for that? Would 160mm work? I also assume Cthulhu would be gargantuan, I have always pictured him being collassal sized but the Reaper Bones mini doesn't reflect that size scale so perhaps he'd be more a Starspawn or aspect of Cthulhu? Meh, who cares? I'm HAPPY with the two pieces and looking forward to painting them as I couldn't wait to assemble them! 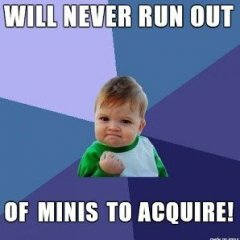 But any help and advice about base size would be quite useful, thank you!